06.00: Battle’s O’er 1000 individual Pipers across the United Kingdom and countries around the world commence the day’s commemorations with the traditional Scottish lament played at the end of battle – Battle’s O’er. 18.55: The Last Post 1000 individual Buglers sound this historic tribute at WW1 Beacons of Light locations across the Nation and UK Overseas Territories. 19.00: WW1 Beacons of Light Over 1000 Beacons of Light symbolising an end to the darkness of war and a return to the light of peace. 19.05: Ringing Out for Peace 1000 Cathedral and Church Bells ring out across the Nation, and beyond, in celebration of Peace. 19.05: A Cry for Peace around the World 100 Town Criers throughout the United Kingdom and other countries around the World join together in an International Cry for Peace around the World. To support this Day of Events, in the Ely DA, we intend to ring 100 rows (i.e. 100 blows from each bell) at as many of our towers as possible, during the weekend 10-11th November. Any ringing that can take place at 19:05 on 11th November, and any ringing that is more extensive than 100 rows, will of course be welcome, but the important thing is to mark the occasion at as many of our towers as possible. See the pages for the individual Districts (Cambridge, Ely, Huntingdon and Wisbech) for the plans so far at each of the District towers. Use the Comments page to add a comment to show if you are able to help, or to say what is planned at an individual tower (information from comments will be included on the District pages as appropriate). Alan Winter has offered to coordinate the ringing throughout the Ely DA, so please contact Alan on vicechair_at_elyda.org.uk with any comments or queries. Details of the nationwide Battle's Over events and arrangements are here, or click on the 'Battle's Over' logo above. In addition, the Ringing Remembers campaign is promoted by the Central Council of Church Bell Ringers, together with the Big Ideas Company, and the Ministry of Housing, Communities & Local Government. 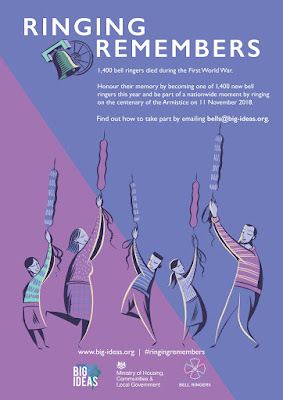 This a campaign to recruit 1400 new bell ringers to replace the 1400 ringers who lost their lives in the 1914 - 18 war. 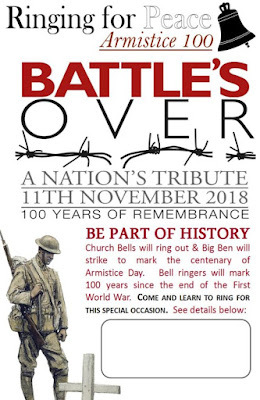 There are two posters which you can download to promote the Ringing Remembers campaign, and to publicise ringing and teaching at your local tower; click on the images below. For any help and advice on teaching new learners, contact the Recruitment and Training Subcommittee of the Ely DA on rats_at_elyda.org.uk. N.B Use the Comments page to show how you can get involved with this project.